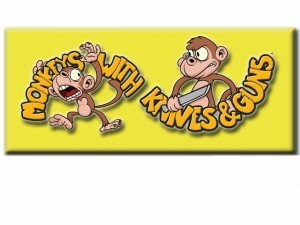 Blackball Games launched their Kickstarter campaign for Monkeys with Knives and Guns. In Monkeys with Knives and Guns, players take control of a band of armed monkeys trying to gather bananas. Each die represents a monkey. All of the players roll dice at the same time, and then determine which monkeys grab a banana, kill opposing monkeys, or horribly injure themselves with their deadly weapons. The player with the most bananas at the end of the game wins!